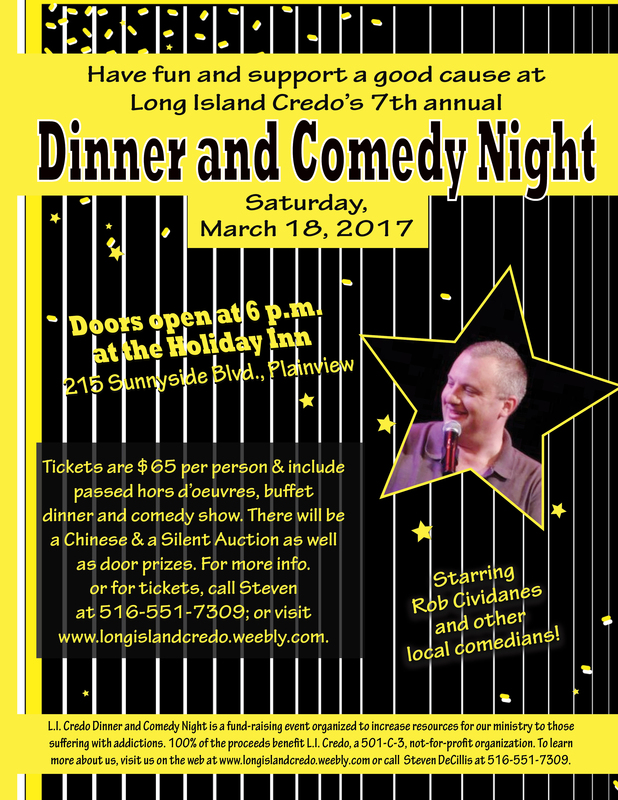 Click below for a printable flyer for the upcoming Credo Dinner and Comedy Night fundraiser. There is a full color and a plain flyer. •Click below for a printable copy of Chapter 4 of The Big Book of Alcoholics Anonymous. •Click below for an application to attend the next Long Island Credo weekend. •Click below for a copy of Long Island Credo's Statement of Faith. •Click below to open an editable sample donation request letter prepared in MS Word format on our organization's letterhead. Replace the date and the information for the business you are soliciting at the top and your name and your phone number at the bottom. Many business prefer or require this type of letter when donating. •Click below to download a copy of our 501c3 document.